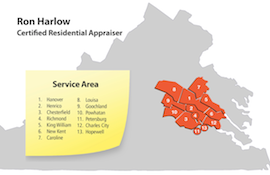 Goochland County has some of the highest home values in the entire Richmond Metro area, particularly the eastern portion. With 22,685 residents, it is a beautiful 290-square mile area that runs along the James River, just west of Richmond. Known for stunning views and stately homes, property values are currently very strong in this market surrounding Hermitage Country Club and Kinloch Golf Club. Interesting trivia: Goochland’s favorite son is Cy Young Award Winner Justin Verlander of the Huston Astros.